Time Tracking - How Does it Work? Or, you can do it from the Time Tool or Track Time page. We will be reviewing each option below. It automatically shows all the tickets assigned to you that have been updated during the week by you or any team member. On this page, you can see all the worked hours for all your spaces. If you want to add hours to a ticket you are not assigned to but that you have been working on, you can do it by typing the ticket number. It will show some matches and you need to select one of them. The Add Entry button will get enabled and you only have to click on it. The ticket will be added to your weekly page. 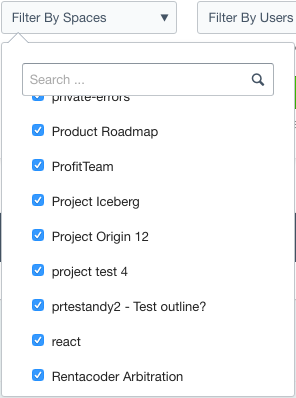 You can also add tasks (not tickets) for things you have been working on, i.e. "Call with customers - demo". 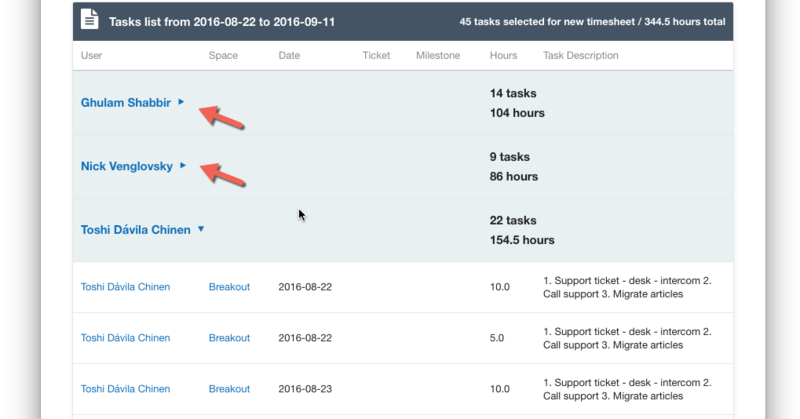 Once you have all your tickets and tasks, you can add all the worked hours on the boxes. When you finish, click on the SAVE button. You can check all the worked hours of your previous weeks by clicking on the Show previous week link. As its name says, you can add your worked hours on a daily basis. It has the same features as the weekly with the difference that it has an export option which can be helpful to export your worked hours from all the spaces you are working on. You can filter your hours with From and To date criteria plus all your spaces. If you don't see the Time Tool in your space, you can install it from Admin > Tools > Time by clicking on the Add button. Note: Only an owner can install tools. You can only add tickets of that space. The Daily doesn't have an export option. It has been moved to "Time Report". The weekly has a new option: Filter by Milestone. You can now select the users of your space in order to export their hours. You cannot select other spaces. Spaces: This is only available at Portfolio Level. Check point 3. You can decide what information you want to display. 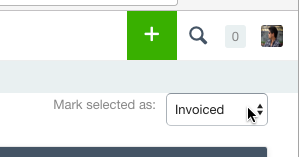 All the reports you run can be saved by clicking on the "Save selected tasks as timesheet" button. 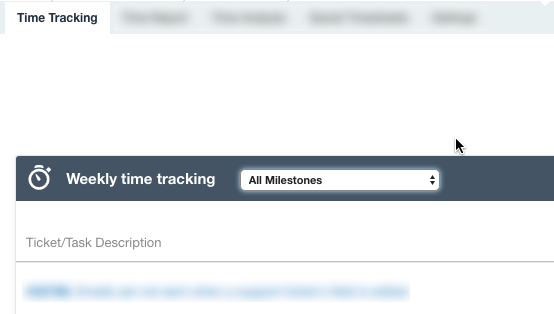 By default, it fills the Timesheet Name with the From and To dates. You can change it if you want to. There is also an option to "Save group subtotals only". If you select this option, only the "grouped by" hours will be saved. 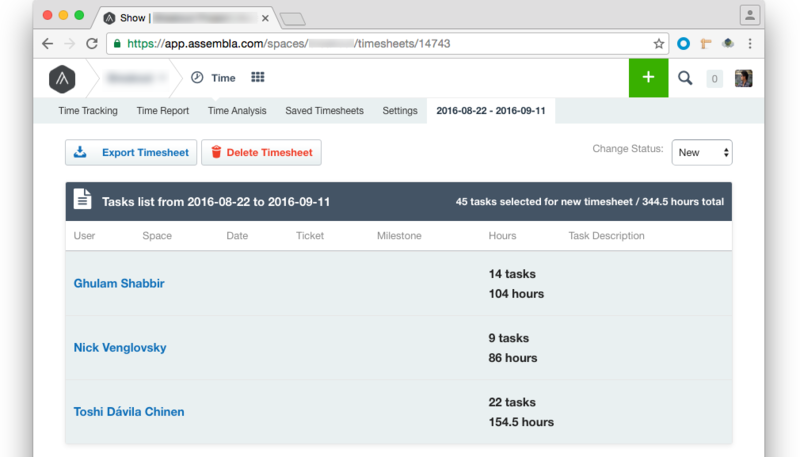 Click on the "Save Timesheet" button. 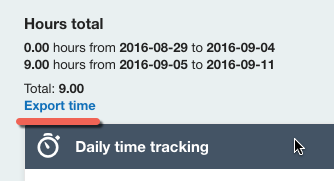 The timesheet has been saved and we can see it right away by clicking on the "Go to saved timesheet" button. As you can see, only the grouped hours are in the report. 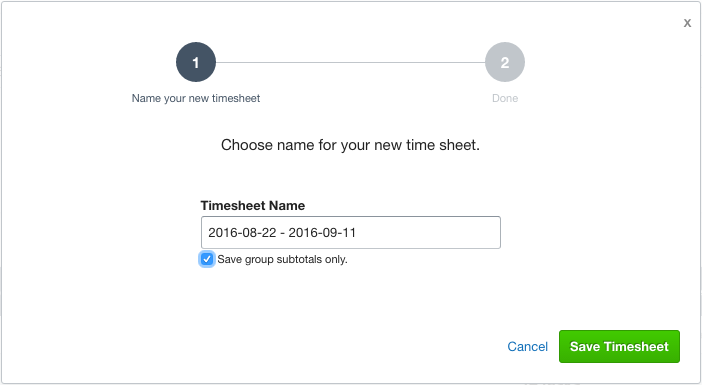 On this option you can access to all the saved timesheets but before looking deeper on this, I'd like to let you see how a timesheet looks like if we don't select the "group" option when saving it. You can click on the names and see all the detailed hours. Let's review what other things you can do here. 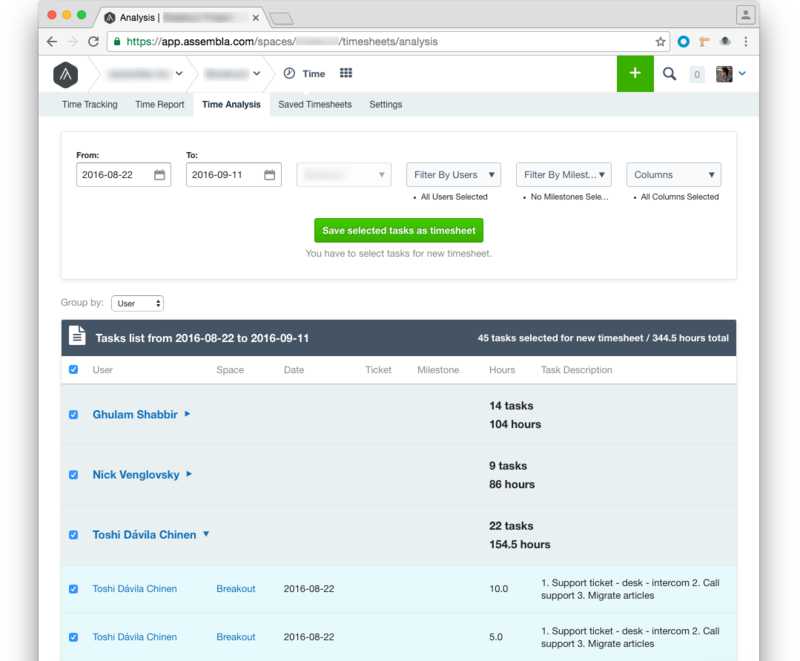 You can export your timesheets into CSV by clicking on the Export link. If you need more than 1 timesheet, there is a faster way to do that, you just need to select all the timesheets and then click on the "Export Selected" button. If you saved a timesheet by mistake or if you don't want it anymore, you can delete it by clicking on the Delete link. If you need to delete more than 1, you can select all the timesheets you want and then click on the "Delete Selected" button. by selecting one or more and clicking on the "Mark selected as:" dropdown. Note that when any of the statuses is selected, the timesheets will be updated without any confirmation. You can configure the maximum allowed hours per ticket per day. Let' say you set it up to 8 hours, it means that if a user wants to log more than 8 hours on one ticket for one day, he will see an error. The Portfolio is a product that is available only on some plans. How do you know if your space belongs to a portfolio? Easy, you just need to check the navigation bar and you will find the logo of your company OR the name of the portfolio. If you click on it, you will be redirected to the portfolio. The URL of a portfolio is https://Your_portfolio.assembla.com. Note that you can still access your spaces either from your_portfolio.assembla.com or app.assembla.com. It includes all the same options as at the space level except that now the "Filter By Spaces" is enabled. It works exactly the same as at the space level. 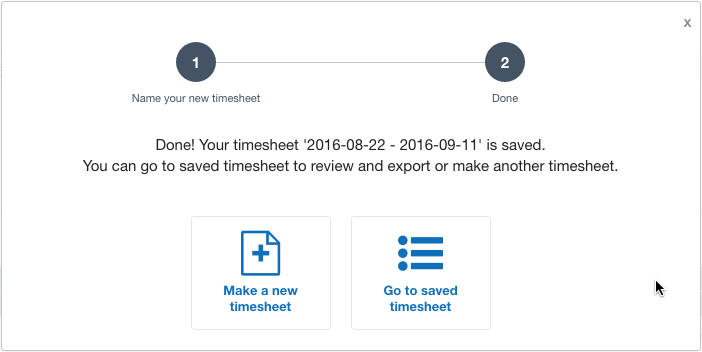 You can review, delete, export and change the status of your timesheets.